Complex of lactobacteria, bifidobacteria and Saccharomyces with zinc chelate and inulin. + supports hair, nail and skin health. + regulating chemical processes in the brain thus affecting the response to stress, anxiety and memory, as well as mood. 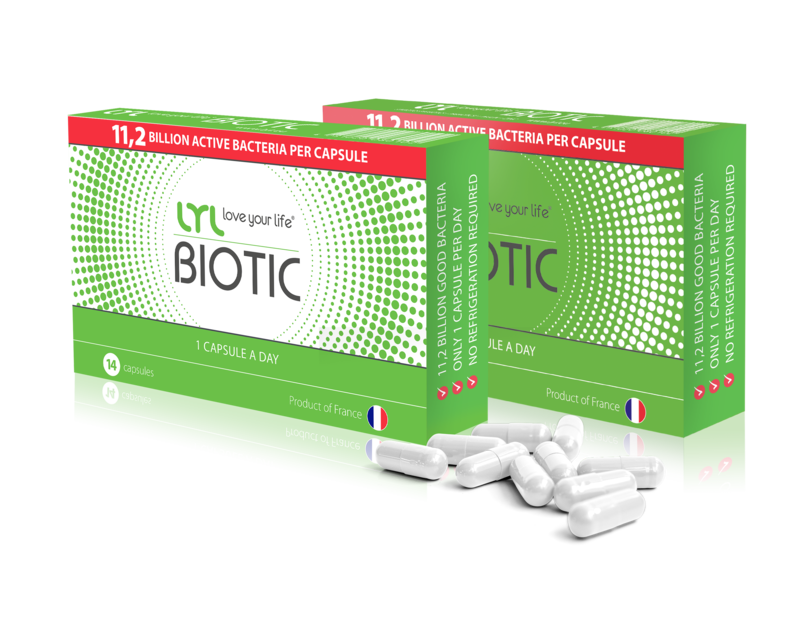 LYL BIOTIC contains an amount of bacteria unprecedented in products in Latvia – 1 capsule contains 11.2 billion CFUs and 9 different strains of microorganisms: Bifidobacterium infantis, B.lactis, B.longum, Lactobacillus casei, L.rhamnosus, L. gasseri, L. plantarum, L. reuteri, Sacharromyces boulardii, inulin (a water-soluble fiber) and zinc chelate. A unique, patented capsule material that guarantees stability of the bacteria throughout the storage period and protects them from the effects of gastric acid upon consumption. The bacteria have been harvested with the innovative lyophilization or freeze-drying method which guarantees that the bacteria are activated only upon reaching the alkaline environment of the intestines. The innovative capsule material and form of bacteria offer a rare advantage – LYL BIOTIC does not need to be refrigerated. LYL BIOTIC is one of the rare probiotics on the market that is purely a probiotic/prebiotic product without any additives. It does not contain artificial colorants, lactose or gluten, preservatives, salt or yeast, allergen, heavy metals or GMOs. It is suitable for vegetarians. Inulin; plant-based hydroxypropyl-methylcellulose (HPMC) capsule; zinc mono-L-methionine sulphate; Lactobacillus reuteri; Bifidobacterium lactis; Lactobacillus casei; Lactobacillus gasseri; Lactobacillus plantarum; Bifidobacterium infantis; Lactobacillus rhamnosus; Bifidobacterium longum; Saccharomyces boulardii; purified water. Artificial colorants, lactose or gluten, preservatives, salt or yeast. Does not contain genetically modified organisms. Suitable for vegetarians. Does not contain allergens listed under Regulation (EU) No.1169/2011 of the European Parliament and of the Council. Suitable for diabetics. Does not contain heavy metals, pesticides. Recommended daily dose: 1 capsule. Recommended to be taken before a meal, with a glass of water. It is recommended to consult a physician about the required duration of use. If you are taking a course of antibiotics, you may begin taking the product during the antibiotic course. Suitable for children from the age of 3 or as long as the child can swallow a capsule whole. 1 capsule of LYL BIOTIC is an efficient daily dose. LYL BIOTIC is the best probiotic in Latvia in terms of price and efficiency of the variety and amount of bacteria. LYL BIOTIC is a complex of highly active bacteria for preventive and acute treatment. Do not exceed the recommended daily dose. Do not use this dietary supplement as a substitute for a nutritious and balanced diet. Do not use after the expiry date shown on the blister pack. Store out of reach of children. LYLBIOTIC must not be used together with systemic or per oral antifungal drugs. Registered on the Register of Dietary Supplements of the Food and Veterinary Service of Latvia; Reg. No. 10605 and 10754.